Versace Home Builders are excited about this year! our book of plans for your new home. Have a plan you've designed yourself? Bring it in and we can quote on a home and land package using your own design. Our plan or yours! Our land or yours! Home prices in the south east of South Australia are currently the most affordable they have been in my thirty years in the construction industry. Having a positive outlook is paramount in your decision to sell your home and build your new home. 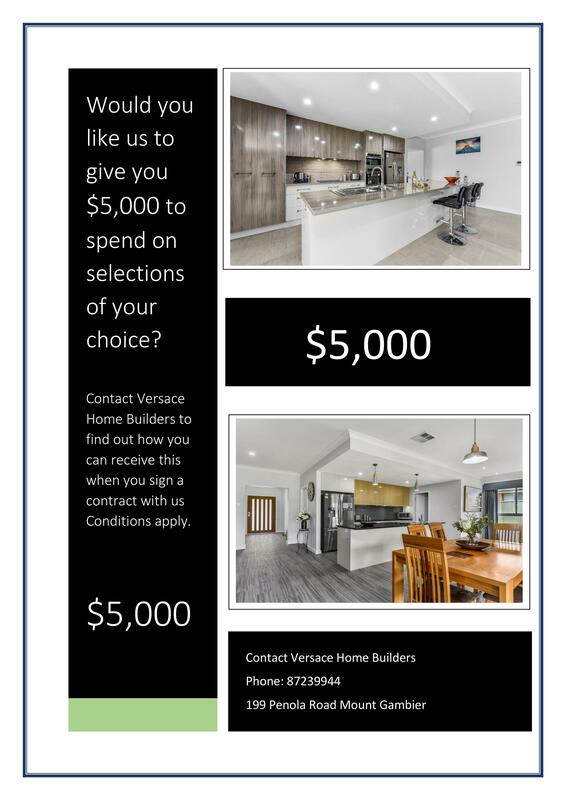 At Versace Home Builders you will find our home and land pricing to be competitive and great value for your dollar. In conjunction with affordability we also have land available to give you greater flexibility in your choice of home and land Packages. 17 New Allotments in our Brand new section of Corriedale Heights Now selling. Ready for your Home and Land Package. With blocks on hold and already sold, get in quick to secure your new address! By visiting our website, you will find our award winning homes have all the latest trends and technology available as well as free upgrades from many of our suppliers. Hope to see you at one of our homes soon.